Lawn Mount Address Plaque with Christian Cross - - religious theme aluminum address plaque with a Christian cross. Personalized with a one-line address. Arch shape. Made in USA. Prestige arch with ornate cross (large image) 15.5"W x 10.25"H. Holds up to five (5) 4" characters. Prestige arch with cross 15.5"W x 10.25"H. Holds up to five (5) 4" characters of up to seventeen (17) 1.25" characters. Prestige arch with rugged cross 15.5"W x 10.25"H. Holds up to five (5) 4" characters of up to seventeen (17) 1.25" characters. Classic arch with cross 15.5"W x 10.25"H. Holds up to five (5) 4" characters of up to seventeen (17) 1.25" characters. Classic arch with rugged cross 15.5"W x 10.25"H. Holds up to five (5) 4" characters of up to seventeen (17) 1.25" characters. Arch with celtic cross 16"W x 11"H. Holds up to five (5) 4" characters of up to seventeen (17) 1.25" characters. NOTE: The number of characters determines their size. Character counts must be five or fewer for 4" characters. Includes two 24" lawn stakes. These signs are made specifically for use with the lawn stakes and have integrated extensions to hold the stakes. 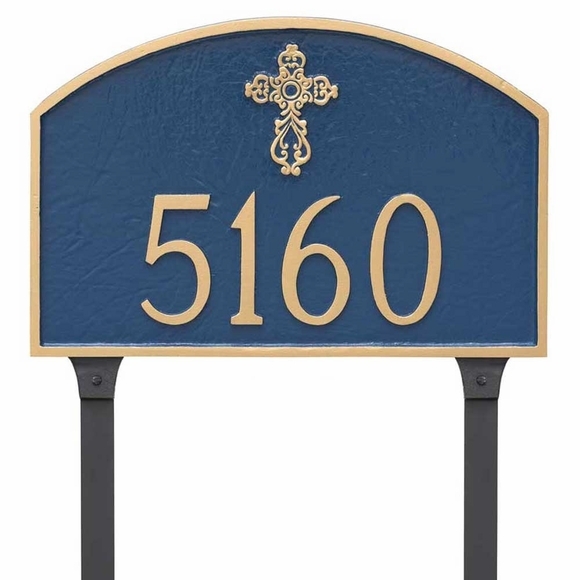 House number plaque with religious symbol. Solid cast aluminum construction. Characters and border are part of the sign, not added on. Custom made for you in the USA. Our new address sign is blue with a Christian cross. Some minor assembly required. The poles that go into the ground are long enough that I was able to bury them about 10" in the ground and the sign still stood tall and is very visible. The numbers are easy to read from a distance, which is the whole point of the sign. The sign adds class to the curb appeal of our home. Completely satisfied.